If feng shui is your cup of tea, Lilian Too will be pouring cupfuls of this ancient wisdom at a seminar in Penang. FRANCIS DASS writes. EXPECT Penangites to make a mad dash to shops selling traditional Chinese paraphernalia this weekend. Too will be at Penang's E&O Hotel on Sunday. Then, armed with the hexagonal mirrors (bhat gwa) and gourd replicas (wu lou) possibly disguised as pendants, miniature wind chimes fashioned into trendy earrings and bags, and suitcases bulging with the feng shui compass (luo pan); the lot are sure to descend on Penang’s glorious E&O Hotel on July 30. The reason for this flurry of activities: Lilian Too, the unequalled dispenser of feng shui wisdom, will be blowing into town up north to give a talk. Too, of course, is extremely well known amongst all circles of Malaysian society — as well as an international audience — which values the contributions that feng shui can make in enhancing health and wealth. 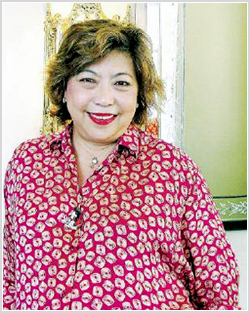 “My take on feng shui is very modern,” says Too, explaining why her brand of geomancy is very popular with the public. “Feng shui is knowledge from China that’s useful in modern times. It is a matter of adapting it for modern life. I take some credit for the popularity of feng shui now,” she says, frankly. Whatever the secret to her knowledge in this ancient Chinese practice, Too firmly believes that no one has a monopoly on feng shui and, thus, the knowledge belongs to everybody. For this reason, she is returning to Penang to conduct a “Feng Shui for Property 2006” seminar. Sub-topics at her seminar include “How to Evaluate Properties from a Feng Shui Perspective” and “How to Increase Good Fortune in Your Home”. Tickets are priced at RM48 each. Click here for more details on Lillian Too's Feng Shui for Property 2006.